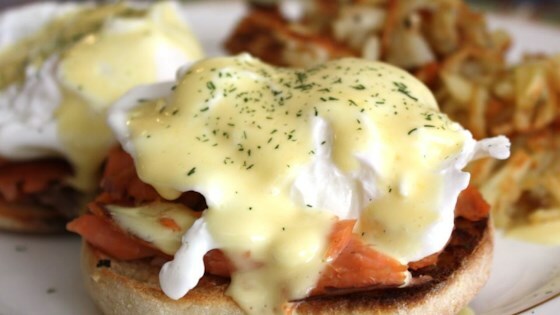 "The easiest way to get perfect Hollandaise sauce is to use a blender. This recipe has all the same ingredients as the classic, but no double boiler and no chance of the sauce separating. I love the lemony flavor on fresh steamed asparagus!" In the container of a blender, combine the egg yolks, mustard, lemon juice and hot pepper sauce. Cover, and blend for about 5 seconds. Place the butter in a glass measuring cup. Heat butter in the microwave for about 1 minute, or until completely melted and hot. Set the blender on high speed, and pour the butter into the egg yolk mixture in a thin stream. It should thicken almost immediately. Keep the sauce warm until serving by placing the blender container in a pan of hot tap water. For perfect Hollandaise sauce, break out the blender! A very good recipe and it will thicken nicely if the butter is "bubbling " hot when it is added to the running blender in a slow stream. I have been using this recipe for over 30 years! Delicious and easy! Use the full recipe though, as I only used part the first time and it didn't blend well with not enough ingredients in the blender.